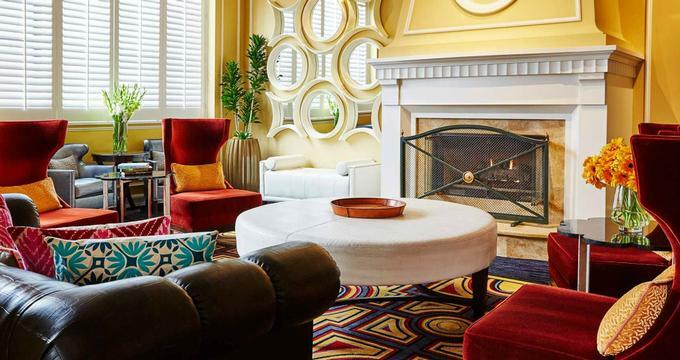 Set in a historic building in the heart of Salt Lake City, the Kimpton Hotel Monaco Salt Lake City is a hip, upscale hotel that offers a stylish retreat for both business and leisure travelers. Located a short walk from the Salt Palace Convention Center and Temple Square, the sophisticated retreat features well-appointed guest rooms and suites with en-suite bathrooms, contemporary décor and furnishings, and modern amenities, including iPod docking stations, yoga mats, and complimentary wireless Internet. Upgraded suites have separate living areas with pull-out sofas for additional guests, fully stocked wet bars, dining tables and chairs for entertaining, and en-suite bathrooms with whirlpool tubs for two. Deluxe facilities at the hotel include an on-site restaurant that serves New American cuisine, a fully equipped fitness center and variety of ski services, in-room spa and massage services, as well as morning coffee, evening wine receptions and the complimentary use of bicycles for exploring the city. The Kimpton Hotel Monaco Salt Lake City features 225 deluxe accommodations in the form of well-appointed guest rooms and luxurious suites with contemporary décor and furnishings, en-suite bathrooms, and modern amenities. Guest rooms range from between 275 to 350 square feet in size and have double or queen-size beds with fresh, crisp linens, plush pillows and extra comforters, and private en-suite bathrooms with bath/shower combinations, hair dryers, thick towels and Atelier Bloem products. Guest rooms are spacious and bright with individually controlled air conditioning, flat-screen televisions with premium cable channels, direct dial telephones and small kitchenette areas with coffee makers, microwaves, and mini fridges. Extra guest services include a nightly turndown service, and rooms have complimentary high-speed wireless Internet. Guest rooms range from King Guestrooms and Deluxe Guestroom with one Queen or King Beds to Deluxe Guestroom with Two Doubles and Deluxe Guestroom with Two Queen Beds. Deluxe Speciality Suites range in size from 275 to 975 square feet and feature king or queen-size beds with fresh, crisp linens, plush pillows, and extra comforters, and private en-suite bathrooms with showers, spa baths, hair dryers, thick towels and deluxe bath products. Guest rooms are spacious and bright with separate living rooms, queen-size sleeper sofas for additional guests fully stocked wet bars and breathtaking views of the city. Modern amenities include individually controlled air conditioning, flat-screen televisions with premium cable channels, direct dial telephones and small kitchenette areas with coffee makers, microwaves, and mini fridges. Extra guest services include a nightly turndown service, and rooms have complimentary high-speed wireless Internet. The Kimpton Hotel Monaco Salt Lake City is home to the award-winning restaurant, Bambara, which is housed in a historic bank lobby with grand arched windows and serves delectable New American created by Executive Chef Nathan Powers. The sumptuous cuisine is accompanied by an extensive list of libations from the hotel’s bar, The Vault, ranging from handcrafted cocktails, artisan beers, imported spirits, and fine wines from around the world. A complimentary breakfast is served every morning in the dining room and includes freshly baked bread and pastries, seasonal fruit, cereals and yogurt, a variety of signature dishes, and freshly brewed coffee, tea, and juices. Coffee and tea are offered in the hotel lobby throughout the day. Upscale facilities and guest services at the Kimpton Hotel Monaco Salt Lake City include an on-site restaurant called Bambara that serves New American cuisine, a full-service bar known as The Vault, a fully equipped fitness center and variety of ski services. Also on offer are in-room spa and massage services, a 24-hour business center with computers and printing services, complimentary coffee and tea served in the lobby in the mornings, and hosted wine receptions every evening. Other amenities include yoga mats in every room for guests to use, complimentary overnight shoeshine services, same-day laundry, and dry-cleaning services, and valet parking. The Kimpton Hotel Monaco Salt Lake City offers a picture-perfect downtown location for business gatherings and special celebrations such as weddings, ceremonies, and receptions. The boutique hotel boasts 3,100 square feet of flexible event space that include intimate private dining rooms with a grand ballroom for elegant dinners and galas. The hotel also offers a range of specialized services such as catering and customized menus, décor and venue set-up, music and entertainment, and luxurious accommodations. Red rock cliffs and sorbet-colored spindles meet with narrow slot canyons and deep dark crevasses; wind-whipped towers and powder-bound slopes are crisscrossed with slick rock trails and winding paths to create one of nature's most perfect playgrounds. Utah's diverse terrain is breathtaking and boasts some of the world’s best landscapes for outdoor adventure from hiking and biking to mountain climbing, trekking, and skiing. Whether you are an intrepid adventurer looking for the next adrenaline rush or a geology buff wanting to journey through the Earth's violent and fascinating geological history, Utah has something for everyone. Covering 10 acres of beautifully landscaped land in the heart of Salt Lake City, Temple Square is an iconic site that attracts visitors from around the country. The Square is home several religiously significant and architecturally distinct buildings, including the Beehive House, the Salt Lake Temple, the Church History Museum, the Family History Library and Tabernacle, with the most popular attraction being part of the Church of Jesus Christ of Latter-Day Saints. Don’t miss the excellent exhibitions on display in the South Visitors' Center.